Hoover Washing Machines Appliances Range 13kg Load Wizard Wi-Fi – The dynamic Next range of washing machines is the latest innovation from Hoover. The range features a number of machines with different load capacities and here we are reviewing the huge 13kg capacity machine. But all models feature the very latest in washing machine innovation such as digital and full touch LCD displays, 3D Dynamic drum systems and Hoover intelligent wash technology to ensure the perfect wash, every time. This top of the range model also features the brand new Hoover Wizard WiFi technology. This technology allows remote control and monitoring of the machine and the wash progress using WiFi Wizard Technology. The Hoover Wizard and intelligent wash technology help this machine to achieve a A+++ rating for energy efficiency. 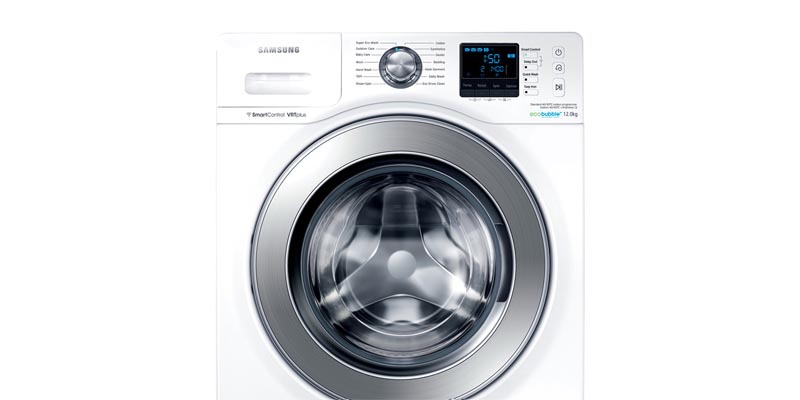 Samsung WF12F9E6P4W 12kg 1400rpm WiFi ecobubble Washing Machine – this Samsung features anywhere “Smart Control” which lets you remotely control and monitor your machine from anywhere using an App on your smartphone. You can easily start or pause your washing and monitor the progress plus get an email alert when the washing is finished. The App is available for both iPhones and Android mobile phones. There is also a smart sensing Load function which automatically analyses the weight of smaller loads and then only uses just the right exact amount of energy and water. The Samsung Eco Bubble technology froths detergent with air and water, these cleansing bubbles then penetrate fabrics faster than just concentrated detergent and can wash clothes in cool water just as as effectively as you would with warm water in other machines. Plus the unique digital inverter motor offers superior performance, energy efficiency and durability, by eliminating the need for brushes. The motor in this Samsung ecobubble offers long-lasting durability all backed by a 10 year warranty. LG Twin Wash Washing Machine – gone are the days of separating up your clothes for different washes, this brand new LG Twin Wash washing machine has a regular front-loading washing drum, but also a second drum underneath hidden in the pedestal. The machine is both wi-fi and NFC (near-field communication) enabled so it’s possible to activate and control it via an app on your smartphone. This Twin Wash machine also features the LG TurboWash technology that uses nozzles at the front to spray concentrated detergent directly onto the clothes to increase efficiency.